When you go to your local zoo, what do your kids say when you ask them what marine animal they’d like to go see? Chances are it will be the sharks or the dolphins. Just how many people visit the zoo and think ‘I wonder if they have any porpoises here?’ Probably no-one. 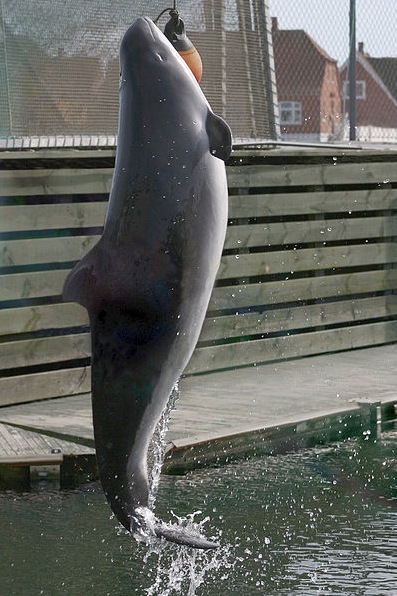 In fact, porpoises get so little attention and are so overshadowed by their related cousin, the dolphin, that the zoo will often demote the poor porpoise and have it working in the zoo cafeteria serving coffee. Well, the porpoise may well be ignored and is certainly not on most people’s top ten ‘most popular animals’ lists, but it is a fascinating animal and dare I say it, maybe even cuter than dolphins. They differ from dolphins by not having a beak, instead they look like a dolphin with an underdeveloped head and they are generally smaller than dolphins. Small is cute right? Unless it’s a piranha of course. When I first saw my first porpoise, I thought it was a dolphin that had had a head on traffic collision, then their little squashed heads seem to appear ‘Ferbie’ like and almost loveable. So no wonder porpoises are generally shy when approaching people if people start shouting “Dolphin!” as their confidence has probably been irreparably damaged. Porpoises bear young quicker than dolphins do and tend to hang out in groups of not more than ten. They are less acrobatic than their close cousins, the dolphin, but they are more sexually aggressive. Therefore, it is safe to say ‘never get into the sea with porpoises around if you if you are buff or are attractive’ or your holiday could all of a sudden become very bizarre, with you becoming traumatised for the rest of your holiday or being extremely happy. Of course, I’m only joking here as porpoises, luckily enough, do not interact with humans in this way. As with most marine animals, their numbers are being diminished by trawlers using fishing nets and their food supply being limited in the same way. Nice one trawler companies, another species about to bite the dust. Keep up the good work, everyone loves you. In the dictionary, a ‘porpoise’ is a ‘gregarious cetacean of the genus phocena’. This does nothing to improve the average layman’s understanding of this largely ignored animal of course, unless you are fluent in Latin and do crosswords in the Times newspaper regularly. To add insult to injury, the most sighted porpoise in the North Atlantic and Pacific has been named ‘The Common Porpoise’ and what a boring name that is. Imagine saying that you’d like to own a ‘Common Dog’ or a ‘Common Cat.’ This doesn’t help in perking up interest amongst animal lovers and opening their eyes to this interesting animal. The porpoise uses sonar to navigate and communicate and generally looks pretty chunky, almost like a dwarf dolphin that has taken steroids might look before a Mr. Dolphin Universe competition – Â yeah, you know that look. The porpoise generally does not do back flips and is shy in general, so the dolphin has come in and stolen the limelight. Next time you visit your local zoo and see a porpoise serving coffee in the zoo cafeteria, give it a high five and tell it that it is beautiful in its own right and has inner beauty, and that it doesn’t have to show off doing back flips to catch your attention like those floozy dolphins do. Click here to find out about the Bull Shark & why some people think it’s more fearsome than even the Great White. CC Image courtesy of Malene Thyssen.